A versatile grill for any household. Two separate heating elements and a reversible non-stick top turn this Raclette grill into a personal pizza oven or crepe grill. Electric, 120v. 1100 watt grill with two separately switched heating elements. 6 pans and 6 spatulas. 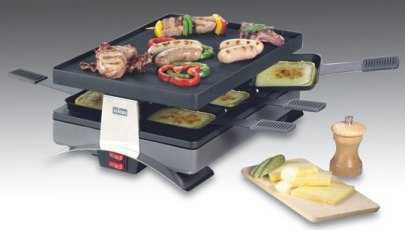 Raclette originated in the Canton of Valais. It dates back centuries to herdsmen tending livestock in the high Alpine meadows. Raclette was made famous by homemakers and restaurants in the cities of Zermatt and Saas-Fee. The basic Raclette ingredients are still the same: melted Raclette cheese served with boiled potatoes, pickles, onions, and Swiss wine. Service Area: New Glarus, Beloit, Sun Prairie, Machesney Park, Baraboo, Fort Atkinson, Roscoe, Monroe, Oregon WI, Platteville, Waunakee and surrounding communities.